Although the unsettled weather conditions during the past week have hindered our work in Trench 2 at the High Pastures site, we are making steady progress with the excavation. Read on for details of some new discoveries made during the week. Heavy rain and strong winds have once again created difficult working conditions for the excavation of Trench 2 at the High Pastures site. However, we have managed to uncover some new features in the trench, which have been complemented by the recovery of more finds. The pit, which forms part of a larger core of cut features in this part of Trench 2, had been cut down through the natural subsoil to the top of the limestone bedrock (showing white in the image). The bedrock had once formed a natural bed of limestone pavement, that would have been riven with fissures known as grykes. As George excavated the pit he uncovered two large granite cobbles, which were resting on a small deposit of fire-cracked stone and pebbles. One of the cobbles was quite coarse, although this may have been chipped to form a fairly round stone. The second cobble was water-worn and must have been collected from a shingle beach - possibly Camas Malag, which is situated around 1.5km to the south of the High Pastures site. Both ends of this large granite pebble have been smashed off, possibly through use, while one side of the stone also shows evidence of polishing through use as some form of quern stone. After recording the stones in-situ and drawing plans and sections of the feature, the two cobbles and the underlying fire-cracked stone deposit were removed. Fragments of burnt and unburnt bone, and pieces of charcoal were also recovered from the pit. However, after the removal of this material, George found that a fissure (gryke) underlying the pit also contained archaeological deposits, including a lump of black material that may be charcoal. We hope to remove this tomorrow and investigate the fissure. 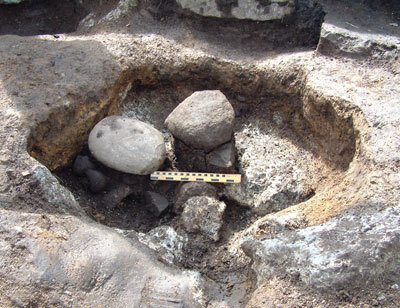 Pit features are generally a common type of find on prehistoric archaeological sites and often contain possible votive deposits. Therefore, it will be interesting to see what the recovered pieces of bone originally came from, while a thorough examination of the stone deposits from the pit will also be made to see what potential function they may have served in everyday life at the site. While George excavated the pit, Martin and Steven continued to investigate the structural elements uncovered in the sector of Trench 2 where we hope to find the original entrance into Bone Passage. As we removed more of the complex sequence of archaeological deposits that make up the fill of the feature above the entrance, we uncovered a series of slabs and large stones below the area of paving that was found last week. Two small voids were also uncovered, from which issued a steady stream of air indicating a connection to the open cave passages below. 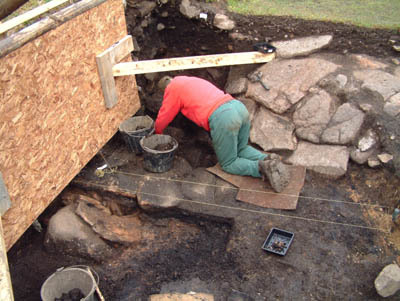 Martin Wildgoose investigating the stone structural elements in the northwest corner of Trench 2. We now know that the large granite slabs to the right of Martin in the image are contemporary with the paving in the base of the trench. These may have formed a type of revetment to the side of the paving, holding back sediment deposits, and may have been a part of a sunken dwelling or work area. 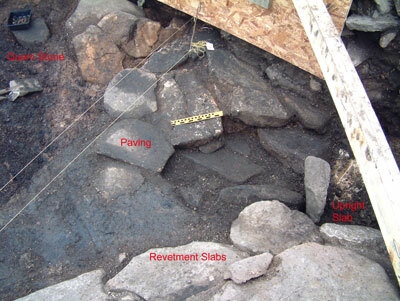 The image below shows a detailed image of the paving in Trench 2 overlying more stone slabs, which may be associated with the former entrance into the cave. 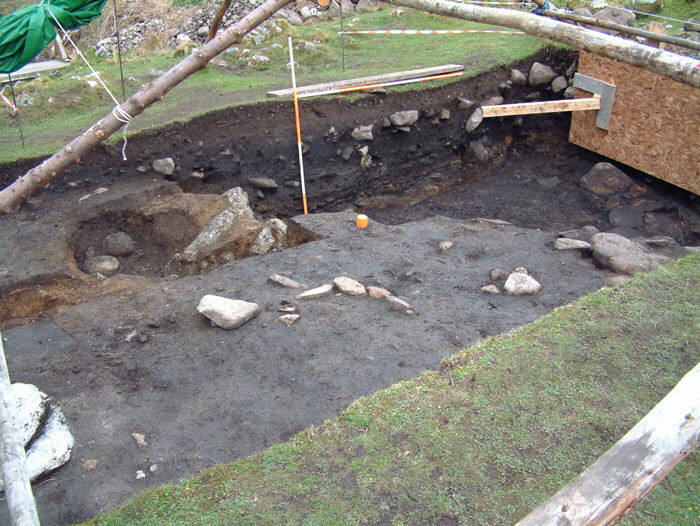 Martin also uncovered more of the large upright slab of stone, that can be seen to the right of the paving in the image. We also uncovered some intense areas of burning in the deposits around the paving in the trench, which also contained fragments of burnt bone and charcoal lumps, and some larger pieces of unburnt bone, some of which may be from pig (Sus scrofa). Few artefacts were found in this area, although we did recover three large chunks of stone (granite) that had polished/smoothed surfaces. Two of these are possibly broken fragments of quern stones, while the third item was a complete saddle quern. Used to process grain, quern stones are generally found in domestic contexts, although they have also been identified in archaeological deposits associated with the formal blocking and closure of souterrains - man-made underground structures. Although it is really too early to speculate on why we have found so many fragments of quern stone in Trench 2, or such a wide range of pebble grinding tools and hammer stones, it is possible that these items may have been incorporated into the fill of this former entrance into High Pasture Cave as a form of votive offering. A general view of Trench 2 taken from the north east, showing pit feature F204 and the main depression forming the back-filled pit above the former entrance into Bone Passage. The image below shows in more detail the main pit feature above the former entrance, including the complex stratigraphic sequence in the north-facing section of Trench 2. 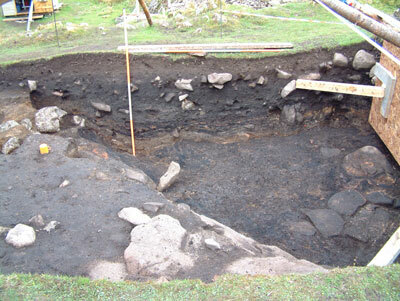 Here you can see the alternating lenses of peat ash and charcoal-rich deposits forming the fill of the pit. These layers are very distinct and show little in the way of mixing, indicating that they may have been deposited into the fill of the pit in a very structured way. At the base of the section the thick buff-coloured layer is a sterile clay deposit, that may have been used to ‘seal’ the area above the former entrance. 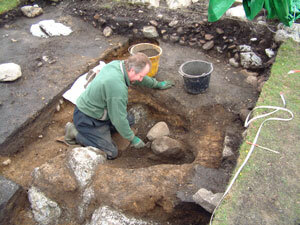 Visit the website again soon to get up-to-date news on the excavations - weather permitting!